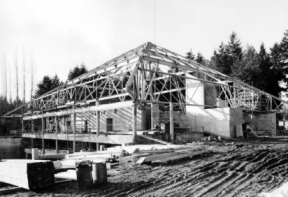 The Consulate General of Japan recently made us aware of a short film entitled “The Big Idea“, which looks at Dr. Iida’s proposal to transport the roof of the Sanyo Pavilion (at the 1970 Osaka Expo) to UBC to create the Asian Centre. The film includes footage from the Osaka Expo, as well as UBC Campus at the time. UBC Archives has now digitized this film and has made it available through cIRcle. Please click on the following link to get to the item page, and then select “view in browser” (under files in this item) to quickly open and view the film.